Des Plaines, IL is a northwest suburb of Chicago and is know as the “Good Move” city. With a population of just over 58,000, Des Plaines is a city which is rich in history, commerce and recreation. Des Plaines is named for the Des Plaines River, which flows along the eastern border the city. The name comes from 18th century French referencing of the American sycamore, which resembles the European plane tree. 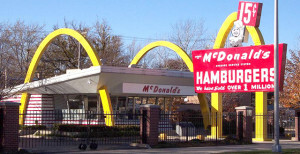 The McDonald’s #1 Store Muesum is located in Des plaines on Lee Street, and represents the beginning of Ray Kroc’s involvement with the McDonald’s franchise. Originally opened in 1955, it was rebuilt in 1984 and is a tourist destination to this day. Delicious grilled burgers, hot dogs, gyros and more. Old-School Steak House and Italian food. Gene & Georgetti’s is one of the most popular steak houses in the region. Casino, live entertainment, restaruants and more. Outlet mall with over 150 stores including Bloomingdale’s Outlet Store, Claire’s Outlet, and Famous Footwear Outlet. Many restaurants and entertainment options as well. A stunning 76 acre park, on the west side of Lee Street, between Touhy Avenue on the south and Howard Avenue on the north. Lake Park features an 18-hole par-3 golf course, picnic areas, playground, hiking trail and more. Lake Park’s main feature is beautiful Lake Opeka which offers fishing for largemouth bass, crappie, bluegill and catfish. There is also a marina for sailing, boating and paddle boat rentals. Lake Park hosts many events during the summer including concerts, movie nights and more.